GeekMom, the blog I helped found and co-edit, has moved to Wired.com, where things are hopping! I've been so busy that science blogging has taken a back seat. But here's a quick update on some cool science things we've been doing. 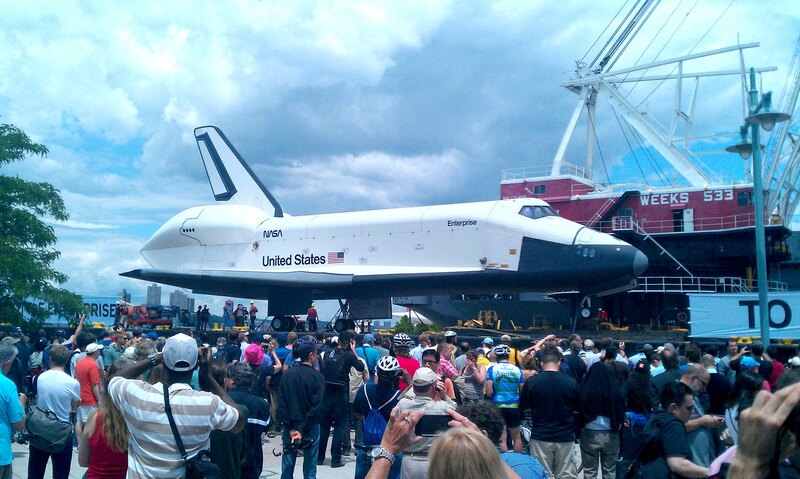 Above, I was lucky enough to be in New York City when the Space Shuttle Enterprise sailed from Long Island to New Jersey and onward to its final resting place on the Intrepid Museum in Manhattan. I wrote a bit more about the exciting event in a post on GeekMom. And on June 5, the family pulled out the Galileoscope to view the transit of Venus across the face of the sun. Although it was cloudy most of the day, the skies did open long enough to let us project this great view of the disk of Venus against the sun. Note the sunspots as well. I'll continue to cross-post here, but for timely news about our science goings-on, please visit GeekMom! And if you're interested in news about robotics (and my forthcoming activity book), stop by the Amazing Robotics Projects Facebook page!